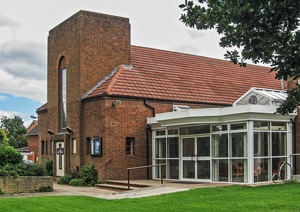 Springdale Methodist Church was founded in 1953, on a plot of land on Warstones Road, purchased from Holts Brewery. A history of the church can be found on the Wolverhampton History & Heritage Society website. Details of our location can be found on our Find Us page. We are part of the South West cluster of the new Wolverhampton Circuit in the Wolverhampton and Shrewsbury District of the Methodist Church. We are closely linked with Wombourne and Beckminster Methodist Churches—all in the southwest of the circuit. Our current minster is Revd Teddy Siwila, who joined us in September 2017. Richard French is our lay worker, helping with the pastoral care work of the church. Our congregation meets for worship on Sunday at 10.30am, including Junior Church. Preachers are encouraged to make a special effort to involve the children in the service before they go into the Junior Church. All are welcome to stay for a coffee and chat afterwards. There is also a Sunday evening service at 6.30pm. At 7.30pm on the fourth Wednesday of the month there is a Wednesday evening worship, and on the afternoon of the second Tuesday of the month is Family Hotpot: a worship session for the young and their carers—a chance to do Messy Church. On the second Thursday of the month there is usually a "Quiet Communion" at 10.00am. 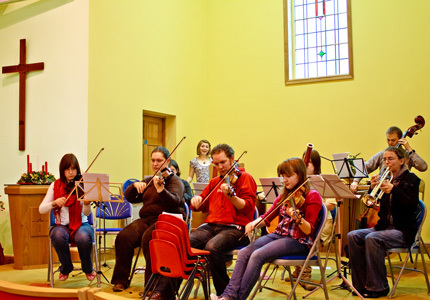 Most of our services have a traditional, but friendly, accessible format. Hymns and worship songs are usually sung to organ or piano, although it is common for other instruments, such as flute, guitar and percussion, to support the singing. On special occasions, like Christmas Eve, the wide range of instruments in use is inspiring. We use Singing the Faith the new Methodist hymnbook as well as Hymns and Psalms, and also our own songbook ("Songs for Worship") for more modern songs. The New International Version is the bible translation used most of all at the church. There is ramp access to the buildings, and a toilet for the disabled. An induction loop is fitted in the main church, and a portable loop system available for other meetings, for the use of those with hearing aids. We have recently had an audio-visual system installed so that media such as song words can be projected during services and other activities. For information about this website's accessibility please see our Accessibility page. The church has strong ecumenical links with other churches in Penn: St. Michael's (RC), St. Bartholomew's (C of E) and Penn URC. A covenant between the four churches was signed in January 1985, and we come together for regular united services with them. Springdale aims to help improve church access for all—especially young people and families. We have committed the church to provide a welcoming, inclusive and safe place for all to worship Christ. As well as our active Junior Church, there are quiet play facilities available in the church during services for young children. Our safeguarding policy, approved by the Church Council, is an important document that reflects our determination to protect the interests of and support all who use the church, however vulnerable. It is available to view and download by clicking on the thumbnail image to the left. We are a strong supporter of Fairtrade, holding sales of Fairtrade products after the morning service on the last Sunday of the month. We have supported the Wolverhampton and Shrewbury District project—Komera—supporting work in Rwanda in the aftermath of the genocide of 1994. The church is used by many groups, both church and community based. These include Rainbows, Brownies and Guides; Beavers, Cubs and Scouts; youth clubs; a poetry group; indoor bowling; Women's fellowship; Wives group; Art Class; Multiple Sclerosis Society; Line Dancing... and much more. The church notices carry information about many of these activities. Over the last few years the church has undergone major improvements to the main church building and other facilities—most recently the new atrium. The church itself was completely refurbished—being turned through 180° in the process! We now sit the opposite way to before: what was the entrance at the back of the church is now transformed into the sanctuary. The decor is now much lighter, and helps to create a reverent, but modern atmosphere.